The Saturn Tumbler in stainless steel and bright colors, including awareness pink. You don't have to give up style for function with this tumbler. It's large size holds enough coffee to get you through your morning. The unique push-button stopper that matches the body so it will keep your hot drink in the tumbler and not on you. 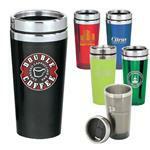 Customize with your logo, it makes a great promotional and resale item for your business. Fits in any standard car cup holder. 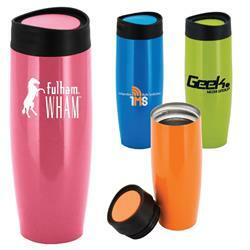 A great custom travel mug tumbler in bright colors! Price includes 1 color imprint on 1 or 2 sides, Individually boxed. Stainless tumbler travel mug.